Bathing a baby can be quite scary, from figuring out the right temperature to holding the baby properly…it can all get overwhelming. But don’t worry, the first time you bathe your baby it will probably scare you to death because you’ll be trying so hard not to make a wrong move and this is completely normal. 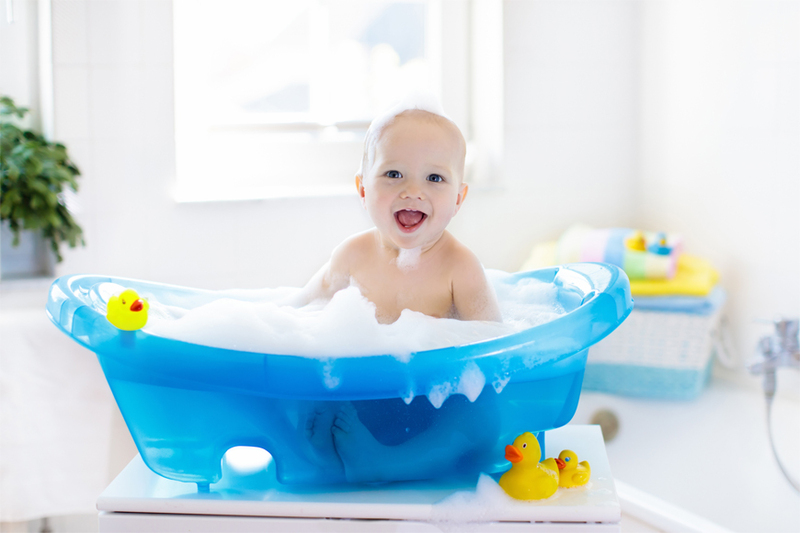 Drawing a bath for your little one isn’t something you learn overnight – it takes time and practice for you to be comfortable enough with your baby in the water and it takes time for your baby to get used to the feeling too. Disclaimer: not every baby is a fan of bath time but in time you’ll figure out what he/she likes. Bath time should be something enjoyable for you and your baby, so put those worries aside and let them enjoy some splash time – it’s a great way to bond with your baby and to make sure their hygiene is on point. Also, make sure that your baby’s bath time does not exceed 5-10 minutes – because as the water gets colder, they may start to get cold too. Preparing the bath for your little one is easy but it just might require a few necessary steps and the first one is to prepare yourself for the bath too. Remove any accessories, roll up your sleeves and be ready to hold your baby for bath time – because you will get wet. By the time you reach the bathtub or sink, be sure to have all your bathing supplies in order because once you put the baby in the water, you cannot leave their side. And if your baby is still quite young, then you must use a baby tub as they cannot sit straight in the bathtub. Start by filling up the tub with about 7 cm of warm water – not too hot and not too cold. It’s extremely necessary not to fill the tub to the top to keep any chance of your baby drowning in the water. And you should always check the water’s temperature before putting your baby in the bath – the ideal temperature should be around 32C. You can make sure it is ideal enough by placing your wrist or elbow to make sure it’s not too hot. And lastly, never place your baby in the tub while the water is running. The first thing you want to do is to slowly ease your water into the water, to give some time for their body to adjust to the temperature. Then make sure you have a firm grip on them at all times and make sure your baby is seated or tilted on your arm comfortably – always support your baby’s head and neck with one hand. Gently start to pour water from the bath on your baby’s head with the water pitcher and wet their hair and skin completely – try avoiding getting water into their eyes as they may get fussy about it. Then use the washcloth or sponge to clean your baby while they are in the tub and use the bath toys as a source of entertainment and distraction while you make sure they are squeaky clean. After you’ve rinsed all the shampoo and soap from your baby’s skin and hair, grab a clean and dry towel and wrap them in it. While you do this make sure one hand is placed under the neck and another under the bottom and start to pat your baby dry – pat off all the water as gently as you can. Once completely dry, rub lotion and baby powder on your baby’s body and put on a clean pair of diapers. And voila! Dry, clean and ready.